Tomotaka Takahashi at Robo-Garage has created a cool scale model of the Tachikoma robots from the Ghost in the Shell anime 'Stand Alone Complex' series. 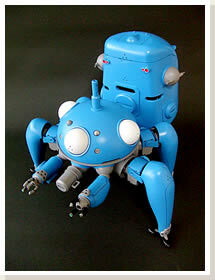 In the anime series, Tachikoma are car-sized free-roaming robots controlled by artificial intelligences. Sentient Swiss Army knives, indeed. Takahashi's carbon-fiber model is only about forty centimeters high, but has nineteen degrees of freedom and runs off lithium polymer batteries. Do you like enormous walking roving robots? Try these on for size, both from the eccentric sculptor Theo Jansen: Animaris Rhinoceros Transport and Animaris Percipiere: Walking Robotic Sculpture Stores Wind Energy. Note: this toy is now available for purchase. See Tachikoma Cyber Superalloy Toy. I'm a bit behind here; this is last week's story from LovingTheMachine; see videos here and here. Belated thanks to CyberStrike for the tip on this story.